Having a baby can usher parents into an entirely new part of life, one that often ends up with employment changes or less of an importance placed on the job as parents focus on their new child. While working and raising a child or children can be difficult, a large portion of families has two working parents. In a report released by the U.S. Bureau of Labor Statistics in April of 2018, 61.9% of families have two working parents. In total, 96.9% of American families have one working parent. With the rise of the internet increasing the availability of remote jobs, many parents are finding themselves drawn to a lifestyle without a rigorous eight to five workday. Remote workers often work fewer hours during the week, and certainly, have the ability to create a flexible schedule that allows them more time with their children and can help them to avoid the cost of daycare. However, any parent knows that being able to focus on work with a young child can be nearly impossible. A new solution to this issue is on the rise, and may just allow parents to have it all. “Co-working space” is a relatively new term, but one on the rise. These workspaces allow for freelancers or remote worked to share a communal space to complete their tasks. Often, these spaces will contain private desks, large shared tables, meeting rooms, kitchens, even coffee. They’re enjoyed by many for the community atmosphere they foster, allowing those who work online to connect with each other, and for their low cost in comparison to renting out a complete office space. However, there might be another new benefit available at certain co-working spaces. At some co-working facilities, daycare is now being offered, offering those working parents of America a more convenient and affordable option. No more stress about commuting to the office that’s located across town from daycare. Parents can take advantage of the ability to work in peace while their children play and learn under the same roof. Different co-working spaces with daycare offer different types of childcare. For example, The Workaround in Brooklyn offers a co-op form of babysitting, wherein different members take each other’s children to the park, the museum, or their homes, allowing the others to focus on their work. 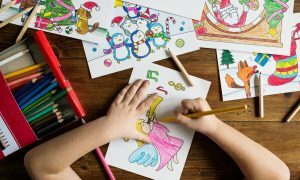 Play, Work, or Dash, in Northern Virginia, on the other hand, allows you to add on a small hourly fee for childcare packages on top of the standard membership price. For parents who work remotely or freelance, a co-working space that offers daycare can be a huge benefit. Research has shown that those who take their work to these spaces report higher productivity and more pride in their work than those in more traditional offices. Add on the ability to avoid commuting to a pricey daycare, and co-working spaces could just solve one of the most significant issues suffered by working parents.